If you have kids that are old enough to be on their own, then maybe after school they get off the bus, let themselves in the house, and do whatever until you get home. Wouldn't it be comforting to know they got home safe? Wouldn't it be nice if it could pop a message up on your computer screen at work when they got home? Well this action will do just that. For the above scenario, you probably would want to set up an activity trigger that monitors your indoor motion sensors. 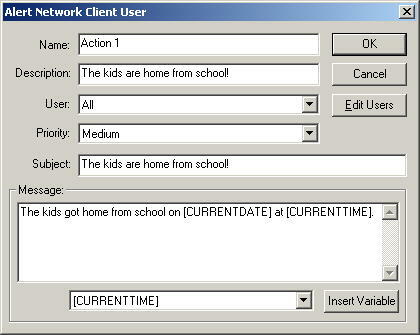 Then you would add an Alert Network Client User action. You have the option to alert anyone using the remote network client, or only a specific user. User - If you've added users already, you can use this combo box to choose a specific user, or you can choose All to broadcast to all users that may be connected to your machine with a remote network client program. Edit Users Button - If you haven't added users yet, if you click this button, it will take you to where you can add them. Keep in mind that any additions, deletions or changes you make to the users are kept even if you hit cancel on the Alert Network Client User action window. Priority - Currently, all this does is to put a ! on the message box if it's set to high priority, otherwise it just shows a normal message box with your message in it. But you never know what the future might bring, so go ahead and set it to what you think is appropriate. Subject - This will be the title of the message box that displays on the client program. Be brief but descriptive enough so you know what it's for. Message - This is the message that appears in the message box that displays on the client program. You can type in the box, and if you decide you want some variable information put in there, you can select the variable to use and then click the Insert Variable button and it will put it in the message at the location of your cursor. Currently you can put the current date and/or current time in the message.